Between the magnificent, sloping hills of northern Tiberdal you will find Podere de Montone. In and around the rural farm apartments and a detached cottage have been realized. Podere de Montone - Gaspara is a beautiful ground floor apartment. You have access to a spacious garden with pool and playground. The farmer lives in the house adjacent to the main building. He still provides regional produce such as fruit, vegetables and home-made jam. 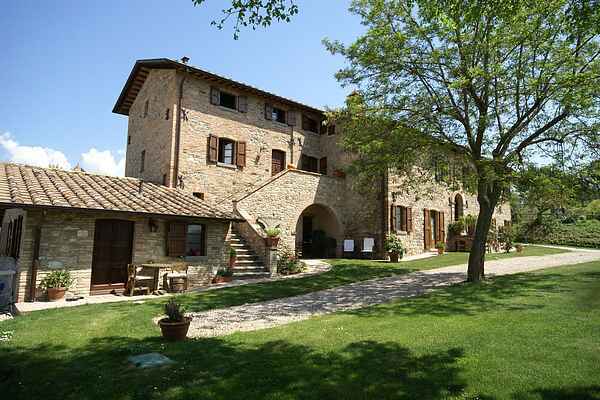 Groceries, post office, bank and restaurants can be found in Montone. The small road past the 'azienda' takes you to medieval Montone (1,5 km) with its beautiful Roman/Byzantine church from the year 1000. Umbertide (9 km) is named after one of the sons of Umberto, who helped rebuild the city after barbaric destruction. Fancy a day at the beach? You are only 30 km away from Lake Trasimeno. Gubbio and Perugia are at about 40 km. With its numerous 'palazzi', including the Palazzo dei Consoli, Gubbio is one of the best kept medieval Italian towns. This palace is situated at the remarkable Piazza Signoria and offers formidable views of its surroundings. Perugia, the capital of Umbria, is famous for its art among other things.